Specifically looked for a blanket by this manufacturer. What a find! Warm & soft and washes like a dream. Would recommend.you won’t be disappointed in quality and looks. Berkshire's most loved fabrication has been made even fluffier! What makes Extra-Fluffy so special is its super high pile fibers that create cuddly warmth without too much weight so you can enjoy it's plush comfort year round. Heavyweight Extra-Fluffy fabric has an irresistibly plush, cloud-like softness that's supremely soft and oh-so-cozy! Note from the designer: If you know and love Berkshire's original Extra-Fluffy fabric, you understand how fluffy yet lightweight their fabric is. With the heavyweight version, you'll find the fabric is much denser and offers a weightier warmth perfectly suited for cold weather. Comfortably fits twin, full, queen and king sized beds. The twin is 64 x 90, full is 80 x 90, queen is 94 x 90, and the king is 110 x 90 inches. Machine wash separately in cold water and dry without heat. Dimensions 90.0 In. X 94.0 In. Super soft and lightweight... perfect for warmer weather nights as for you dont sweat from this lightweight little piece of soft heaven and the color is absolutely gorgeous shade of plumb that isn't offensive to my Male counterpart that doesn't like shades of purple I dont think he even realized it was a purple lol. The size was nice, really big and fits our queen bed in the fifth wheel with plenty of extra .. love this blanket it definitely will be coming into home and being used for more than camping. Fluffy, Fluffy, Fluffy!! So Cuddly, You will never want to get out of Bed! By far the most Comforting Blanket I’ve ever slept under! It’s Plush, Soft, Fluffy. It is NOT heavyweight at all as described. This blanket is soft and fluffy! We use it as a throw on out bed and we absolutely love it! 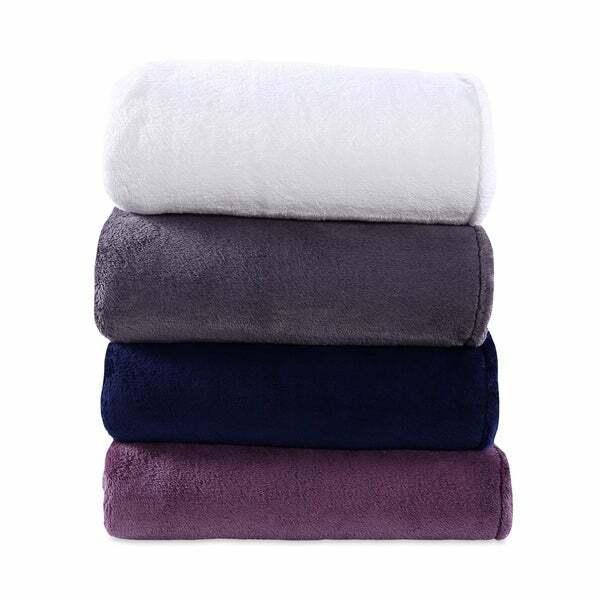 Great value for a blanket this size and we love the color! I ordered the Royal flush (Purple color)...It is wonderfully soft and snuggly. It seems to run a little on the smaller side so if you have a deep pocket mattress you may want to order the queen size for a full size bed. I also wish the purple were darker than it actually is. I would love to have it come in a dark plum color. Overall, I rlike it. Super soft and fluffy blanket. Great for snuggling on the couch. The dark blue is beautiful and elegant. Love the texture of this blanket. Everyone likes to pet it. We really like this blanket. Super warm and very well made. I was worried about how soft it would be but it is really soft and looks nice on the bed. It will be a staple for years to come. This is the best, softest blanket you could ever purchase. We bought two and are going to purchase more. My 12 year old son 6 month old and my husband and I all love the softness of the blanket. Perfect on a chilly night or inside cozy. Beautiful grey and blue colors. I absolutely love how soft and warm this blanket is! One of my favorites, for sure! I love this blanket. It is super soft and great to snuggle up in. It washes and drys great and doesn't leave alot of fuzz in the dryer. It keeps us nice and warm. I love it. But, unfortuately I need to return it. I thought I was ordering a weighted blanket. I need to order a 15lb weighted blanket. This is super nice. I ordered it for a friend and when it came, I loved its softness and ordered another for my daughter. I think they will be very happy with them. "On the Berkshire web site they state the queen size is 90 x 90: you say it's 90 x 94. Which is correct because it will change how I order. Thanks"
The correct size is 90 x 94 inches. My kids both have trouble sleeping. Hoping these help. Plus they look soft. "What is the weight of the King size blanket"
The King Heavyweight Extra-Fluffy blanket is 6.25 lbs.